I am going to have purple nightmares…. I knew it. That purple fiend! 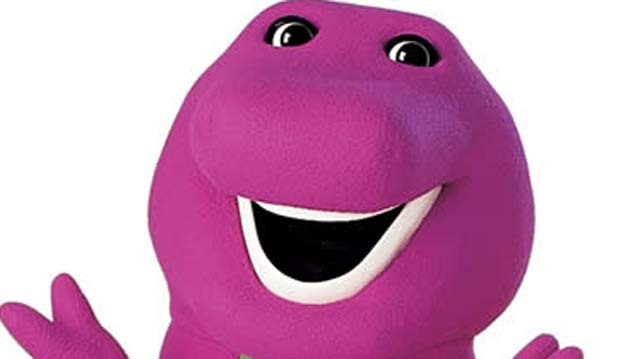 Time to remind some parents not to let their children watch Barney shows. Hilarious proof is hilarious. The mathematics of this proof is so elegant I cannot restrain myself from reblogging this. Enjoy! While driving, I typically listen to Sirius Satellite Radio, dividing my time between BBC World Service and Radio Classics (a channel devoted to the old time radio dramas and comedies). BBC is advertisement free (excepting adverts for its own programs of course) but Radio Classics has advertising for various things, including other channels, on the half-hour. One of the channels advertised is BB King’s Bluesville. During the commercial, BB King comes on and says (as close to verbatim as I can remember) “I’m the mayor. And if BB King doesn’t like it, I figure no one else will either.” Huh. This is, in logic, known as an implication, i.e., if A then B, or A->B (pronounced “A implies B”). This implication is, as the saying goes (and as can be shown in a truth table), logically equivalent to | B -> | A (man, I wish I had more symbols in the Blogger interface: -> is an implication arrow; | is negation or “not” so that | B -> |A should be read “not B implies not A”). Let’s look at the essence of BB’s statement: “If BB King doesn’t like it then no one else will like it.” Using the logical equivalence above, this translates to “if not no one else will like it then not BB King doesn’t like it. '” Next, “not no one else will like it” translates to “there exists someone who will like it.” And “not BB King doesn’t like it” translates to “BB King likes it.” Thus, BB’s statement is the logical equivalent of “if there exists someone who will like it then BB King likes it.” I’m confident that there is no music such that there does not exist someone who will like it. Thus, there is no music that BB King does not like. I’m guessing that that’s not what he meant.